Occupying the moral high ground: Whose side is the Church on? This current economic system which creates such inequalities cannot endure because it is unjust. It is powerful. It is very powerful, but it is not a god, and we serve a God who cannot be mocked. So since you have already lost, since you’ve already lost, I invite you today to come and join the winning side! The Church – particularly established Church – has to make its mind up on where it stands on the big issue of the day: Economic justice. Does it seek to avoid to ‘take sides’, or does it seek to remain true to the Gospel? It has been interesting to follow the contortions St Paul’s has gone through over the past fortnight, in order to maintain a position of ‘neutrality’ – to avoid to be seen to be ‘taking sides’ – either with business as usual or with the protestors. A classic Anglican position, but one which is increasingly unsustainable. The Church is not a version of the ‘Oxford debating society at prayer’ – it has a Gospel to uphold. As Jim Wallis has said on many occasions, if you take poverty out of the bible it falls apart. The Bible is not neutral on injustice. It is not neutral in relation to those who lead lives of luxury whilst ignoring the plight of the hungry and destitute on their doorstep. It is not neutral on usurious moneylenders, who grind the faces of the poor. Did Wilberforce seek to put an end to slavery by opening up St Paul’s for debates between slave masters and their opponents, whilst resolutely refusing to be seen to ‘take sides?’ No. Wilberforce took sides against slavery – and in so doing made himself unpopular not just with slave traders but with the establishment of the day. But in the end, he won through. Did Archbishop Tutu seek to end apartheid by acting as an impartial adjudicator in jocular debates between apologists for the regime and those who sought change? Of course not. Did Archbishop Oscar Romero seek to end the Salvadorian death squads by inviting them to debate ethics with those who they labelled subversive Communists? I doubt it very much. Not know for his outspokenness before he took up office, in the face of the injustices of his day he felt compelled by his Christian faith to speak out. Romero took sides against the brutal regime of the day. And paid with his life. The Church in this country today faces none of these threats. There is little risk in taking sides with the poor and the oppressed, beyond the risk of an odd bit of ridicule in the right wing press (unless you are the Canon Chancellor of St Paul’s, that is). Are you going to side with those who are suffering disproportionately from the spending cuts, or with the big corporations who cheat the public purse of at least £35bn in tax avoidance? Are you going to side with the cleaners and the caretakers, the shopworkers and care assistants struggling to make ends meet on £6.08 an hour, or with the company directors who, in spite of our precipitate economic crisis, awarded themselves 50% pay increases last year? Are you willing to take the side of the millions in this country (as well as globally), who will struggling with the choice to ‘heat or eat’ this winter, or with the energy companies making millions from rigged energy markets? Are you going to side with those in low paid jobs, struggling to make work pay in the face of an effective marginal tax rate in excess of 70% (when tax and benefits are taken into account), or with investment bankers, hedge fund managers and other corporations who threaten to take their business abroad if their 50% tax rate isn’t cut? So why is the Church so timid, so reluctant to take sides? At last a clear Christian voice, many, many thanks for this! Comfortable western evangelicalism till now has been deafeningly silent on issues of justice, preferring it seems to me, to preach on sexual ethics almost exclusively. I’ve heard honest, decent evangelicals – agreeing with the right wing ideology – that people are poor because of moral failings rather than what the bible clearly teaches on the causes of poverty – injustice. Its no surprise really, the 7th century prophets had identical issues with their comfortable contemporaries: “For the vineyard of Jehovah of Hosts is the house of Israel, and the men of Judah His pleasant plant; and He looked for justice, but behold bloody iniquity; for righteousness, but behold a cry!” (Is 5:7). The cry of the poor in our time is beginning to sound nearer home as the financial system implodes around us. Hopefully the Christian response will become more relevant and actions on reform of the present pernicious “greed is good” system more robust. This indeed would be good news for the poor. This is a really interesting post. I think the problem that arises is that people can claim to be religious, even beleive they are religious and with that sorted they can then carry on being unpleasant having put no thought into the messages of their religion. They rather use it as a balm for their conscience. I believe the church tacitly endorses this position – as long as they have members in their club and they get money from them and have a degree of power over them they are happy. Examples include great ironies like real aggression in the name of Jesus and modern equivalents of papal indulgencies. This is excellent as always and raises all kinds of accompanying issues, not least where we stand on Capitalism. I agree with the critique that affirms the Kingdom of God is not only an ecclesiology but also a polity or an economy. That’s not as specific as saying God is a member of the Green Party but certainly concrete enough to be affirmative or critical of a system. Capitalism crushes the poor and torches the planet. I appreciated what Rowan Williams had to say today though I think even he was looking for cuddly Capitalism. A Robin Hood tax is a positive step but if the Sheriff of Nottingham and Prince John are still in power then we run the risk of simply spring-cleaning the status quo. I take heart from what is happening in Greece. Thank you spelling out the challenge; now to rise to it! Brilliant article. I really want to hear church leaders say something like this. And it’s up to ordinary Christians to do so. The pertinent question is indeed, ‘What would Jesus do?’ But I don’t think Jesus would have been interested in ‘economic justice’ even though he was very interested in looking after the poor, generosity and the moral dangers that come with wealth. The Church should have a lot to say on these matters (and it should patiently accommodate the protestors) but it should not side with them because their interests are not Jesus’. I would say there is more of an atmosphere of bitterness related to envy at the camp. Jesus never came across that way. Many in the camp give the impression that they would rather live under a Stalin or a Mao where there was more real poverty, less generosity (I would imagine) and less freedom to debate what Jesus would have done. The reason that the poor suffer disproportionately with the spending cuts is that the government spends most of its money on the poor. In fact one might argue that there are hardly any countries, throughout the whole of history, where the poor are/have been better looked after than they are in Britain today. Our main problem is not one of economics. Step up the Church? I found a great deal to disagree with in Ben’s comments but in particular so not see where Jesus’ attitude to poverty, wealth or debt fail to constitute interest in economic justice. After thirty years of reading on this I still don’t think there’s a better book than John Howard Yoder’s, ‘The Politics of Jesus’. Try Chapter Three on ‘The Implications of the Jubilee’. The protestors seem more interested in clamping down on the rich than looking after the poor. In Britain today, even though there is relatively little real material poverty, there is much envy. Jesus taught us not to envy. Even though there is relatively little material poverty, there is great spiritual poverty. Jesus spoke of ‘streams of living water’ not Socialism. The Church should be doing the same. Jesus also taught us not to try to find contentment in material things. The church should concentrate on the same. The redistribution of material things should be secondary to that and should mostly be achieved through generosity. Jesus was not a ‘Robin Hood’. I can’t speak for the protestors at St Pauls, but I can speak for Church Action on Poverty – and our partners including the Methodist Church, the United Reformed Church, the Baptist Union the Quakers (and others) – who have all enthusiastically signed up to the Close the Gap campaign. We are clear in saying that the gap between rich and poor in the UK is harmful to us all – not just materially, but in many other ways as a society. Gross inequality undermines trust, is linked with higher levels of crime, mental ill health, reduced life expectancy and numerous other social ills. This is not a matter of envy, but of asking simple questions as to whether this is the best way to order our society and economy – in the light of the Gospel. Jesus lived several centuries before ‘Robin Hood’ – but if you read the Gospels, he had a very challenging message for the wealthy. How else do you interpret Jesus’ words to the rich young ruler: “Sell everything you have and give to the poor, and you will have treasure in heaven.” (Luke 18). How else do you explain the story of Zaccheus? “Look, Lord! Here and now I give half of my possessions to the poor, and if I have cheated anybody out of anything, I will pay back four times the amount.” (Luke 19). These are not stories of Jesus showing envy, but of Jesus demanding that the wealthy of his day relinquish some of their wealth (especially where that wealth had been accumulated unjustly), in favour of the poor. And this is not even to start looking at the Old Testament Prophets, or the actions of the Early Church…. Of course, Zaccheus *gave* his money to the poor. This is not any argument for taxes or forced redistribution of wealth. I note your “Robin Hood” comment thought I’m not sure where you see it’s relevance. It is a story about taking money from the rich by force; however, even with wealth gained unfairly, that is not presented anywhere in the Bible as a solution to poverty. The money obtained by Zaccheus through cheating he paid back four times. This was partly in response to the Israelite legal requirement of Exodus 22 to pay back double what was stolen. Zaccheus doubled this amount to show the sincerity of his reform. This penalty would have been conferred upon him after a guilty verdict by the judges. Hence, one lesson of the passage could be that those who have had money stolen from them can seek redress through the courts i.e. a one-off legal process. If the system is corrupt and redress is not possible, then one must leave justice to God, not take it into one’s own hands. The lesson in this passage is that the individual touched by God’s grace, becomes both penitent and generous. Obviously, the ideal modelled here is the perpetrator reforms and voluntarily repays the stolen money with compensation. The lesson is not that WE should demand the rich give us their money, either personally or corporately via the state. The Bible does not condemn redistribution by the state through taxes explicitly (though it condemns unfair taxes) but it does in every case that it addresses poverty, presents the solution as 1) faith in God, 2) contentment (no greed/envy), 3) hard work and 4) *willing* charity from those who have wealth i.e. God requires the rich be generous to the poor but also that “Each one of you should give just as he has decided in his heart, *not reluctantly or under compulsion*, because God loves a cheerful giver” (2 Cor 9:7). Sorry Mark, but I can’t accept the implication of your argument that the Bible is anti-taxation. The Levitical Year of Jubilee is an act of redistribution, which I’m sure some of the folk who accumulated the land in the intervening years weren’t too impressed about – but was designed to restore some degree of equity in the distribution of the key element of wealth of the day (ie land). This was clearly based on the view that the prevailing economic system generated unjust levels of inequality of power and wealth, which led to some members of the community becoming debt-slaves to others. In that context, to enable all human beings to flourish, it was legitimate to ‘Close the Gap’ between rich and poor by redistributing wealth. Taxation is simply a means by which we achieve a similar Common Good today. I have tried to be careful to show that I am not against taxation per se nor imply that the Bible is against it. I have only said that the Bible does not offer it as the primary means of solving poverty. The jubilee of cancellation of debt, fallowing fields and not gleaning fields fully to the edges are more about prevention of starvation. I, and very few people, would be opposed to that. These people, however, were still poor and it is not a long-term solution to poverty which requires something else. Interest-free loans, such as those referred to in the jubilee passages, can alleviate temporary poverty or perhaps give a step up towards self-sufficiency (such as through the purchase seeds or tools). I am all in favour of such loans today, as interest-free aid to people wanting to become self-sufficient. Such initiatives could certainly solve poverty in a significant amount of cases. It should be noted that these loans were made without the agency of any government, rather it was a command for neighbours or relatives to take care of the poor in their midst. I suppose a person had recourse to the elders if no help was forthcoming but the Bible does not go into that. In these passages, gifts are clearly favoured over loans. Again, individual generosity is favoured. There was the stipulation that loans would be cancelled at jubilee but a person entering into such an arrangement would do so knowing that this would be the case. I am certain he had the option not to make the loan. The net effect of this jubilee system would be to re-distribute wealth to some degree assuming debts were not fully repaid beforehand. I am not against redistribution of wealth. Indeed, charity itself involves this, but voluntarily. The Bible commands us to be generous to the poor but ideally in the form of free and unconditional gifts. The option to loan is given (as less ideal) for those who do not want to give (for whatever reason), but this provides a much greater potential of help to the poor without relying on coercion. This is a better system! This brings me back to my conclusion that the better solutions to poverty are not compulsory but voluntary, and must primarily focus on the individual spiritual component. If we are looking for a Biblical example or model for ending poverty (which has been the gist of much of this discussion), you will find primarily exhortations to generosity. While the taxation route is not forbidden in the Bible as a solution to poverty, neither is it touted. It is a temporary solution to starvation but not a final one (if, indeed, there is one – Matt 26:11). In fact, what is explicit in the Bible in regard to taxation is a warning about kings’ (which could easily apply to governments’) tendency to benefit themselves and their servants (corporate interests?). 1 Samuel 8:11-18. In our recent history, taxes were used to benefit the rich through bankers’ bailouts. The question is, do you trust your government to spend your tax money wisely on helping the poor (given Biblical and the many historical examples) or do you trust those who have devoted their lives to the cause of helping others, many in the cause of Christ? I’d rather be taxed less and give more to charity and support the charities I, through due diligent research, trust to do the right thing with my money than give it to a government that is known throughout history for misspending and waste. Ben, before I end up ranting and suggest that the space between your ears is clearly a Republic in its own right I want to say two or three hopefully commonsense things. Firstly, Any socialism vs capitalism arguments needs some clarity as to what we mean by ‘socialism’ and ‘capitalism’. Secondly, it does not make for human dignity for philanthropy to be the only approach to poverty. To dismiss protest as ‘envy’ is a crass, offensive distortion. Thirdly, despite U.S. attempts to undermine the country I would still sooner live in Socialist Cuba than Capitalist Haiti. Yes that’s the impression I get of many active socialists – they are less interested in raising the living standards of the poor than they are lowering the living standards of the rich and the fairly comfortable. But I do not believe that is the only motivation of everyone campaigning for social justice. Many do wish to raise the living standards of the poor while allowing the rich and industrious continue to enjoy the fruits of their labour. Jesus never told us to TAKE money from the rich, he told us to work hard for our bread. He told the rich to look after the poor and GIVE money. That’s very different to Socialism…. in fact, it sounds much more like Capitalism, with personal responsibility, to me. The labels (not *my* labels but society’s) are sometimes used accurately, sometimes inaccurately, sometimes to pigeon-hole people and issues into one camp or another, but they are labels used widely to describe current systems of government and economic management, so to not address them in some way, or to ignore them, from a Christian perspective is, I believe, to not address the issue fully, especially as some people are presenting one or the other as a solution to our current economic problems. That was my only reason for bringing them into the discussion. I especially am hearing in many circles Socialism (or just simply “not Capitalism”) presented the answer to our current economic woes. My aim was to show that, if one wants to take a Biblical perspective, it is not necessarily the answer (though it often is in Christian circles). Indeed, if one is looking for a Christian perspective, there are several good reasons to say why it is *not* a good answer. Don’t look to “Capitalism” as the solution either, but it is often misrepresented as the rich taking money from the poor (though in reality it is not just the poor) – nowhere in Capitalism is enshrined the concept of the rich taking from the poor. A significant reason and cause for the existence and problems of the poor is injustice and greed. Those problems lie in the human heart, not economic systems. The same problem would still exist inside Capitalism, Socialism and any other “-ism”. The answer is, as you say (and I agree), to look to what Jesus teaches as he addresses the issues of the human heart and our moral failings. In a practical sense (as we live in a practical world and the problems at least manifest themselves in practical ways), this would involve acknowledging that the Bible does not present forcefully taking from the rich as a solution and, in fact, does not condemn taking from the rich any less than taking from poor. What the Bible does present as a practical solution is “fair weights and measures” (i.e. economic justice) and the rich *giving* money to the poor (i.e. charity). (I won’t include the dozens of Bible verses to back this up as I am sure most people know them well). What the Bible presents as a spiritual solution (and this is always the primary solution) is personal salvation through Jesus Christ, repentance and faith in God. I hope I managed to clear things up a bit. Clarification: My aim was to show that, if one wants to take a Biblical perspective, it is not necessarily the answer (though it often is *presented as one* in *some* Christian circles). Hi Niall, I think I’m to blame for introducing ‘Socialism’ and ‘Capitalism’ into the thread. This is an incredibly complex discussion but I’m trying to unpick whether we should adopt revolutionary or reformist approaches to Capitalism, or some mixture of both. If Capitalism is intrinsically oppressive then doing away with the system entirely would seem to follow. Looking at the current global situation, for the first time in my lifetime I actually wonder whether what we recognize at Capitalism might be breaking down. It has been said (I think, fairly) that the current problems are not due to Capitalism but the linking of business and government in a way that some big businesses are favoured by government (e.g. bailouts at tax-payers’ expense, criminal and irresponsible behaviour overlooked) and some governments are favoured by big business (lobbying and large donations). The source of both of these problems is unfair weights and measures (to use the Biblical phrase for economic injustice) and human greed. None of these can be solved by any political system. In a Capitalistic system these problems are propagated by corrupt business; however, in a Socialistic system those very same problems are propagated by corrupt government. Neither is the solution when the problem is corruption. Having spent time analysing these issues and looking at matters from both sides of the fence, I can only conclude that the solution is the gospel of Jesus Christ and the transformation of human hearts. That may seem trite to some, but I can’t see anything else that would make any kind of impact. I thoroughly agree that Jesus has many warnings for the rich. (I think) he speaks more about money than anything else. And the church should be declaring this loudly at the moment! Perhaps it could start by asking (as Tony Campolo did) ‘Can one be a Christian and drive a BMW?’ I don’t know the answer to this. However, pragmatically we are not choosing between Cuba or Haiti, I am interested in which direction we should take *Britain* in. I would suggest not the direction of Spain or Greece. I think that we should go for the system that allows us to give as much to the poor as possible without encouraging vice. In working out this system, let us note that Capitalism is not oppressive, people are oppressive. And also let us note that there seems to have been rather more oppression under any Socialist government that I know of. 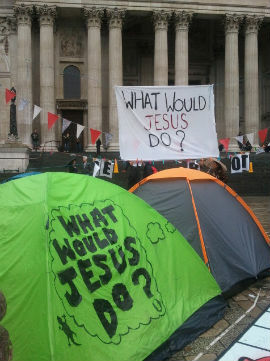 The only reason I use the term ‘Socialism’ is that it is frequently used by the St Paul’s protestors. I am arguing that this is why we should not side with them. We should avoid getting personal but I am not a republican. I happen to have voted to yellow, red, green, blue (according to my conscience) in the four British elections in which I have been eligible to vote. Sorry Mark, we must have been typing at the same time. I agree! The other relevant word is usury. Opposition to usury was there in the early church and as a Mennonite I’m also very much aware that it’s in our Anabaptist DNA. Absolutely! I’m glad you mentioned that. In fact, our entire economic and monetary system is built on usury and that it is one of the main practical causes of poverty that absolutely needs to change. Sorry I didn’t intend for that video to embed. Also, I forgot this one talks more about oil energy depletion. The relevant part of the larger series begins with the video below. I have broken the link to stop it embedding. The preceding and other videos in the series are still worth watching as they all relate to debts and causes of poverty.